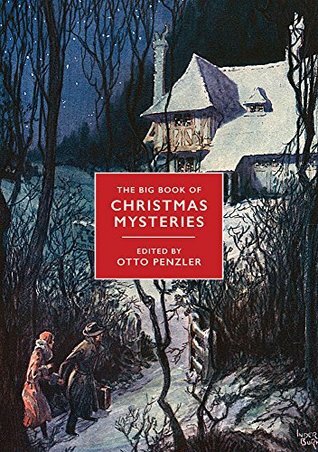 The Big Book of Christmas Mysteries:The Most Complete Collection of Yuletide Whodunits Ever Assembled edited by Otto Penzler is just the book to read at this time of year if, like me, you enjoy mystery fiction with a Christmas theme. It is a big book of 647 pages – so I have an e-book version and dip into into it each Christmas. It contains stories by a variety of authors including Agatha Christie, Colin Dexter, Ellis Peters, Arthur Conan Doyle, Ellery Queen, Edgar Wallace, Peter Lovesey, Peter Robinson, Ed McBain, Sarah Paretsky, Mary Higgins Clark, Ngaio Marsh, Isaac Asimov, G K Chesterton, H R F Keating, Robert Louis Stevenson and more. Will he make it? The evidence against him is strong. It all began when a war broke out between the Timsons and the O’Dowds when Bridget O’Dowd was chosen to play the role of Mary in the school nativity play and Eddie said she was ‘a spotty little tart unsuited to play any role of which the most notable characteristic was virginity‘. The resulting battle ended with the death of Kevin O’Dowd. Rumpole is his usual grumpy self, getting drunk on wine in Pommeroy’s Wine Bar with the prosecuting barrister, Wrigglesworth, instead of hurrying home to his wife, Hilda (She Who Must be Obeyed) who has made him rissoles and frozen peas for his dinner. As I read it I could easily imagine the scenes, with Leo McKern playing the role of Rumpole. Agatha Christie has two stories in the collection – the first is The Adventure of the Christmas Pudding in which Hercule Poirot investigates the theft of a priceless ruby stolen from a Far Eastern prince. The Christmas Pudding in question is a ‘large football of a pudding, a piece of holly stuck in it and glorious flames of blue and red rising round it’ and the second A Christmas Tragedy, a little puzzle of a mystery. Miss Marple tells the story of the death of Mrs Sanders and how it it had been made to look an accident when it was really a cold-blooded murder. I can’t see any connection in this story to Christmas, but it is definitely a tragedy and for a short story it is very complicated. As this is my last post before Christmas I wish you all a Merry Christmas and Happy Reading! A very Merry Christmas to you and your family, Margaret! See you in 2019! Merry Christmas, Margaret! All the best for 2019 and always! And this book sounds like the perfect accompaniment to this time of year, too. Lots of mysteries to choose from, and some great authors, too. Merry Christmas to you and yours, Margaret. This sounds like the ideal book to dip into at this time of year. Merry Christmas, Margaret! How very lovely to read a blogger writing about John Mortimer! Like a little Christmas present! I have a lovely book of short stories called A Rumpole Christmas. The stories appeared first in various magazines and newspapers, and then were collected into this wonderful book the year Mortimer died. I wrote about it here https://lettersfromahillfarm.blogspot.com/2009/12/rumpole-christmas-by-john-mortimer.html, if you are interested. I just looked through it, and I don’t think the story you read is in there. It is in The Second Rumpole Omnibus. Wishing you a lovely Christmastime, and all the best in the New Year. Geez, I used “lovely” three times!